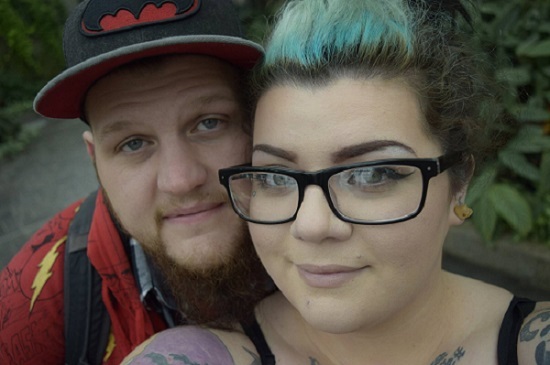 Endometriosis and Cannabis: The New Power Couple? Canada is electric right now in the era of cannabis legalization, and the cultural shift this historic event ushers in is profound; however, for over 250,000 medical cannabis patients, it’s business as usual (though still a reason to celebrate!). Many of these patients are women with endometriosis who have found healing solace in the myriad benefits that medical marijuana can offer them, including myself. 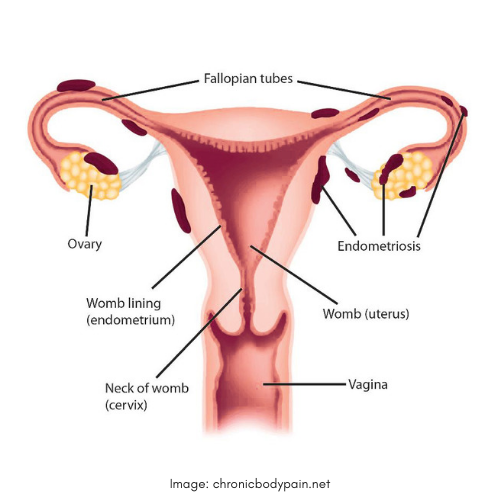 Endometriosis (endo) is a disease found in 10% of women where tissue similar to the endometrium – the tissue that lines the uterus – grows in other areas of the body including the ovaries, fallopian tubes, bladder, bowels, muscle tissue and, in rare cases, the diaphragm, heart and brain. These lesions cause chronic inflammation and a wide range of symptoms, listed in the infographic below. Most commonly these symptoms are treated with hormone therapy like birth control, Lupron or Visanne, but each comes with serious side effects and provides limited symptomatic improvement. Endometriosis can only be diagnosed via exploratory surgery. Surgical excision of endometriosis lesions is the ‘gold standard’ of treatment, and pain management using anti-inflammatories, painkillers and relaxation techniques is common. 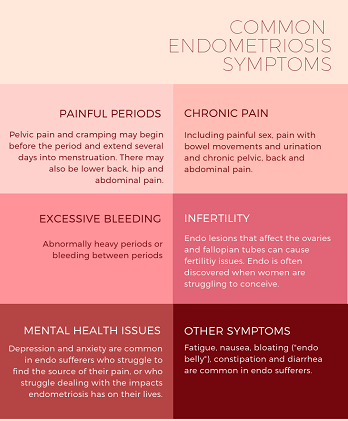 I have been struggling with endometriosis for over half of my life: symptoms began around age 13 with excruciating pain during heavy periods that lasted up to 14 days. At 16, I found out I had polycystic ovary syndrome so I was put on the pill to control it, which worked for about six years. In my early twenties when my symptoms returned, I found an article in Glamour magazine about endometriosis and brought it to my doctor; after several months of multiple doctors and tests, endometriosis was confirmed and ablated via laparoscopic surgery in 2011. That lasted about four years until I went off the pill in 2016 and had a second – excision – surgery at age 30 in 2017. 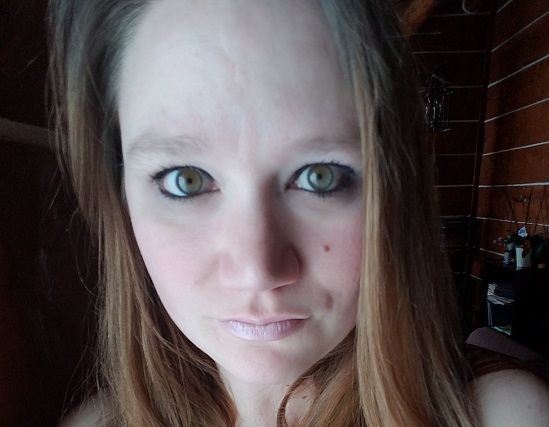 Like many women with endometriosis, I live with daily pelvic pain, and chronic pain in my lower back, hips and upper legs; I have struggled for over 15 years with depression and anxiety and have watched endo’s effects snowball into the rest of my life, affecting my relationships, social life and work life. Only now can I look back and realize that my consistent cannabis use throughout that whole time was probably my way of self-medicating. Cannabis contains compounds called cannabinoids which act on our body’s endocannabinoid system, a network of cannabinoid receptors that have been found to modulate our brain, immune and endocrine functioning. New research suggests it is crucial in hormone regulation related to reproductive function and stress response – certainly of interest to endo sufferers. The two cannabinoids with the most research-backed evidence for therapeutic benefits are THC and CBD. 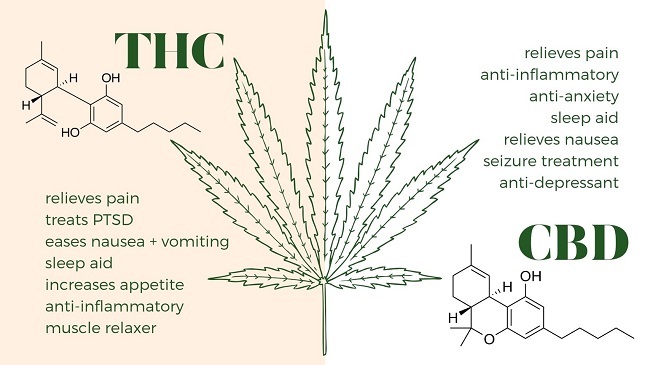 Tetrahydrocannabinol (THC) is responsible for the psychoactive ‘high’ feeling and it binds to CB1 receptors found primarily in the brain and central nervous system, while cannabidiol (CBD) amplifies feelings of calm relaxation and acts as an anti-inflammatory and analgesic, binding with CB2 receptors found mostly in our peripheral organs and immune system. The levels of each of these compounds – and many others – vary widely between strains, and CBD is known to balance out the psychoactive effects of THC so patients can reap the therapeutic benefits of both. Women around the world have been using cannabis for centuries to treat different gynecological issues, and recent research confirms THC and CBD as effective therapies with relatively few side effects. Scientists have even discovered that our natural endocannabinoid system is integral to women’s reproductive health. What does this mean for women dealing with endometriosis? Chronic pain and inflammation are two of the main symptoms that bring patients to medical cannabis, whether from cancer, arthritis, IBS, pelvic pain and more. CBD and THC both have demonstrated pain-relieving, anti-inflammatory qualities and this can make a huge difference in the life of someone with endometriosis. Smoking or vaping dry herb is the quickest way to feel the effects, while ingesting oil or capsules takes 1-2 hours to kick in and the effects last longer. Topical creams and suppositories are also a great way to get the pain-relieving benefits of both compounds by targeting the source. Any woman who has had multiple surgeries for endometriosis can describe how frustrating it is that it sneaks its way back. There is no cure, and it’s impossible to tell when or if endo will make a surprise comeback; however, a recent discovery that CBD may prevent endo cells from migrating is a step in a promising direction. During my excision surgery, the surgeon left an endo lesion on my lung because removing it was too risky, and since I wasn’t coughing up blood (what a nice barometer of success), there was no need to put my body through the unnecessary trauma. But that means that there is still endo in my body, and where there is endo there is the potential for it to migrate or spread, so this research is very encouraging. Another recent study of deep infiltrating endometriosis in mice saw positive results when cannabinoids were introduced and caused self-destruction (apoptosis, one of my favourite words from high school chemistry) of endometriosis cells, leading scientists to the exciting conclusion that cannabinoids may be used to prevent the spread of endometriosis. 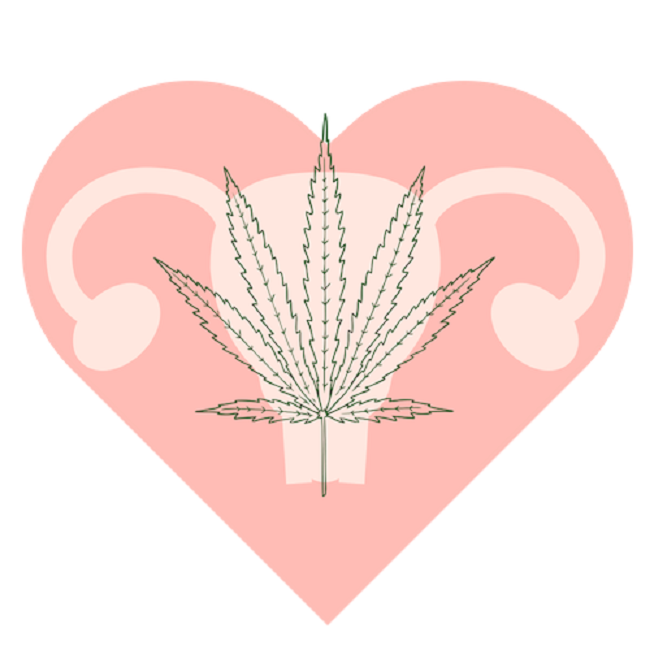 There is a lot of research to be done on the benefits of cannabis for endometriosis, but the research that’s already out there is promising and the anecdotal evidence is overwhelming. Personally, using medical cannabis has changed my life; yes, flare-ups and pain still happen but it has given me back a quality of life that I never thought I would have again, and that is a powerful thing. If you think you could benefit from using medical cannabis for endometriosis, talk to your doctor to learn more. Maia Leggott is a writer, editor and artist with a love of storytelling. She is a passionate advocate for women's health and medical cannabis and writes about her experience with endometriosis on her blog, Feminine Flare. In her spare time, Maia can be found crafting, dancing, cuddling with her cat Stella or watching old episodes of Jeopardy!. My experience with cannabis is that it relieves the pain for the day, but makes it way worse later. In fact I think it caused me to develop an ovarian cyst after experimenting with cannabis for pain from my severe endometriosis. I hope this info helps someone else. Has anyone used CBD for their endo pain? How did you feel? Please share.